The Cygnus spacecraft is back in orbit for its return to flight mission to the International Space Station, coming back from last October’s Antares launch failure. Orbital ATK’s resupply spacecraft lifted off on Sunday atop an Atlas V rocket as the first in a pair of interim missions contracted to United Launch Alliance until the modified Antares rocket will be ready for flight using a new main engine system. Atlas V blasted off from Space Launch Complex 41 at Cape Canaveral Air Force Station at 21:44 UTC, heading into a dense cloud cover over the Space Coast as it made its north-easterly departure. Flying along a coast-hugging trajectory, Atlas V was widely visible from the East Coast of the United States as it fired its massive RD-180 engine on the first stage, making a burn of a little over four minutes before handing off to Centaur for a firing of nearly 14 minutes. Cygnus was sent on its way 21 minutes after liftoff, setting sail for the International Space Station where it will arrive on Wednesday for the delivery of three and a half metric tons of supplies. In the wake of the Antares failure, Orbital Sciences decided to switch the main engine system of the launcher – a plan that had been in place before because of the limited availability of AJ26 engines that represent converted NK-33 engines. The failure, now known to have been a cause of a manufacturing defect in one of the old-aged Soviet engines, prompted the company to accelerate the introduction of the modified Antares, fitted with new RD-181 engines from NPO Energomash – in essence the smaller brother of the RD-180 with only one thrust chamber. Fitting the Antares with new engines and re-building the launch pad at the Wallops Flight Facility was expected to take well into 2016, and Orbital felt the responsibility to fulfill its obligation of keeping up the supply chain to ISS – therefore deciding to contract a pair of Atlas V rockets for interim Cygnus missions. United Launch Alliance and Orbital ATK worked together to get the mission to the launch pad within one year, going through all the necessary analysis required to confirm the launcher was compatible with the spacecraft, also involving a large-diameter launch vehicle adapter flying for the first time on Atlas V.
Cygnus OA-4 is also the first mission of the enhanced Cygnus spacecraft that features an extended cargo carrier manufactured in Italy, new solar arrays from Orbital ATK that are lighter and more efficient than their predecessors, and an improved Service Module with reduced dry weight. Sporting a larger cargo module and launching atop the powerful Atlas V rocket allows Cygnus to set a record for cargo upmass in a Commercial Resupply Services mission as a total of 3,513 Kilograms of supplies are sealed within the pressurized cargo module. Cygnus is loaded with a wide variety of items ranging from food provisions for the six crew members in orbit, consumables such as hygiene equipment, maintenance hardware for the various systems of ISS to scientific experiment hardware. Also hitching a ride aboard Cygnus are 17 small CubeSats that are looking forward to a deployment from ISS in January along with a new satellite deployment mechanism that will be able to release satellites of up to 100 Kilograms from ISS. Science equipment delivered by Cygnus will support about a dozen of the 250 investigations active aboard the orbital laboratory for the closing days of Expedition 45 and heading into the new year with Expedition 46. Highlighted payloads are a new incubator facility built for simple use by the crew, an experiment looking at the behavior of fluids traveling through packed column reactors and a new combustion study that evaluates different textiles for their flame retardant behavior. Also onboard Cygnus are spacewalk jetpacks for future use as well as high-pressure gas tanks to top up the gas supply system of the U.S. Segment of the orbital outpost. 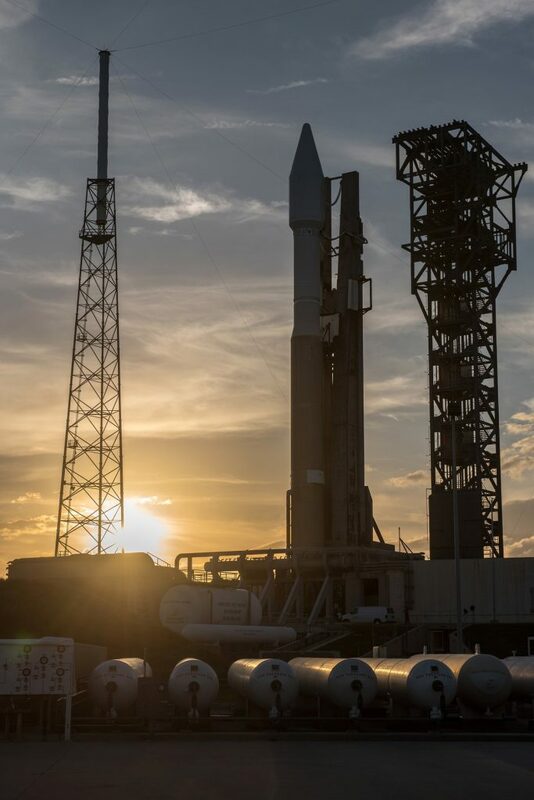 Coming back from weather-related launch delays Thursday through Saturday, the Atlas V launch team and Cygnus spacecraft support team reported to console seven and a half hours prior to the opening of the launch window. 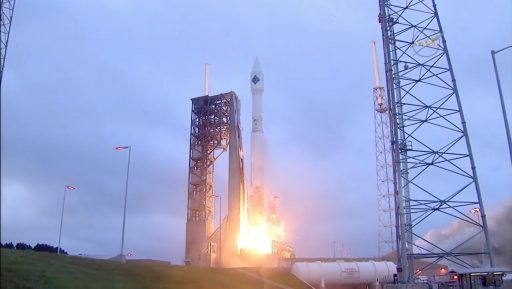 Atlas V – owed to surplus performance and flexible trajectory computations – had a 30-minute launch window at its disposal, unprecedented in Space Station history. 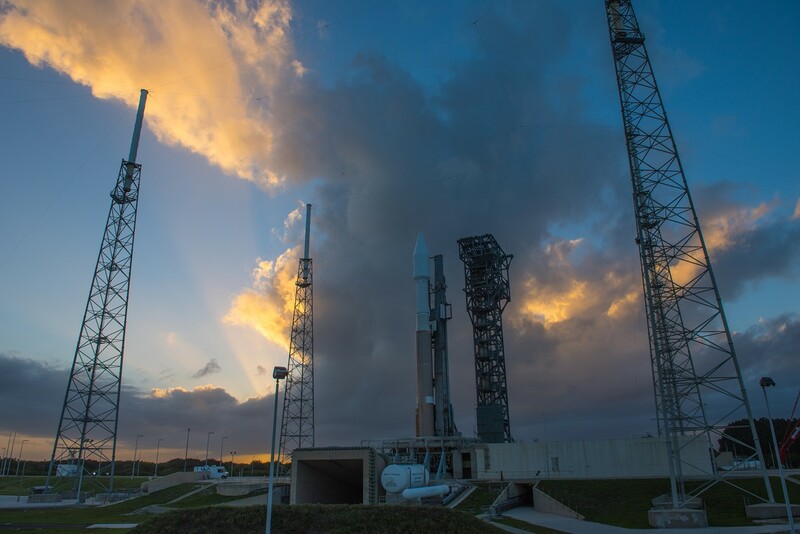 As clocks began counting down, the Atlas V rocket was activated for a set of extensive checkouts of the various Flight Control, Communications, Flight Termination, Propulsion and Electric Systems of the rocket. Cygnus was powered up six hours ahead of liftoff to undergo its own set of checkouts. At the pad, teams finished closing out the Atlas V rocket and the different ground systems before evacuating the launch complex and setting up road blocks. Range Controllers began preparing equipment and watching over range clearance as the hazardous tanking operation approached. Clocks held for 30 minutes at T-2 Hours to allow teams to finish setup tasks for the propellant loading sequence and polling revealed all systems to be in readiness to pick up the count and load the Atlas V rocket with propellants. As soon as the countdown resumed, the chilldown operation of the propellant ground systems, the transfer lines to the rocket and the launcher’s tanks got underway. Also, Helium and Nitrogen vessels onboard the vehicle began charging to reach flight mass in time for liftoff. Starting with the Liquid Oxygen tanks, Atlas V headed into fueling right around L-2 hours as the –183°C LOX started flowing into the upper stage followed a short time later by the larger Common Core Booster. Going through an initial slow fill before transitioning to propellant fast fill and eventually topping, Centaur received 15,700 liters of LOX while the CCB was filled with 185,500 liters of the oxidizer. 94,600 liters of Kerosene fuel had been loaded into the booster after Wednesday’s rollout. 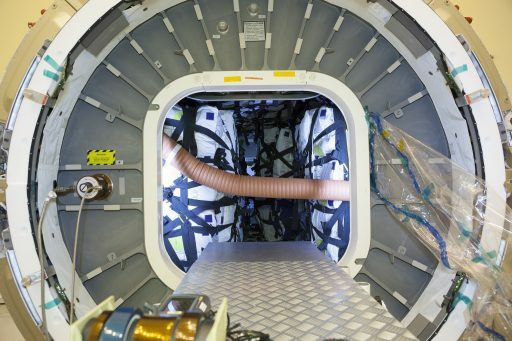 The final tank to be loaded was the upper stage’s Liquid Hydrogen tank that received 48,100 liters of the –253°C fuel starting inside L-90 minutes. To loft Cygnus into orbit, Atlas V only required its most basic configuration comprised of a two-stage stack with the Common Core Booster as first stage and the trusted Centaur Upper Stage sitting atop. The rocket stood 58 meters tall and 3.81 meters in diameter with a total launch mass of 334,500 Kilograms when fueling had finished around half an hour prior to liftoff. Atlas V went through a repetition of testing activities, checked out its engine gimabling systems and received its optimized flight software, adjusted for upper level winds. Clocks paused at T-4 minutes to give all stations a chance to catch up with any open work and transition the Cygnus spacecraft to internal power before polling of the launch team. 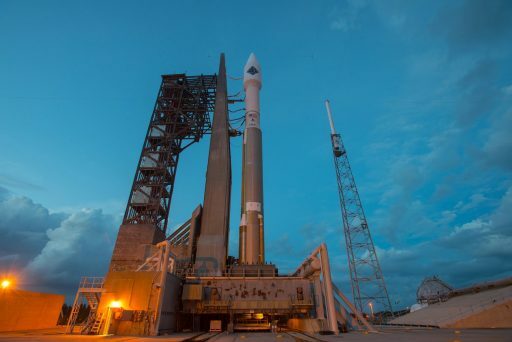 Polling all Stations shortly before picking up the count showed that everything was in readiness for the 60th Atlas V mission and its premiere launch in support of the International Space Station. In the final four minutes of the countdown, Atlas V completed a highly choreographed sequence of steps to pressurize its propellant tanks, switch to battery power, assume control of the countdown and arm its Flight Termination System. The massive RD-180 engine soared to life three seconds ahead of liftoff, throttling up to a total launch thrust of 390 metric-ton force. Start-up was closely monitored to ensure the powerplant reached operational conditions before the rocket lifted off. Atlas V started climbing at 21:44:57.1 UTC, rising from its launch pad for a 21-minute ascent mission using a rather simple flight profile as compared to some of the recent Atlas launches that featured multiple burns of the Centaur Upper Stage. 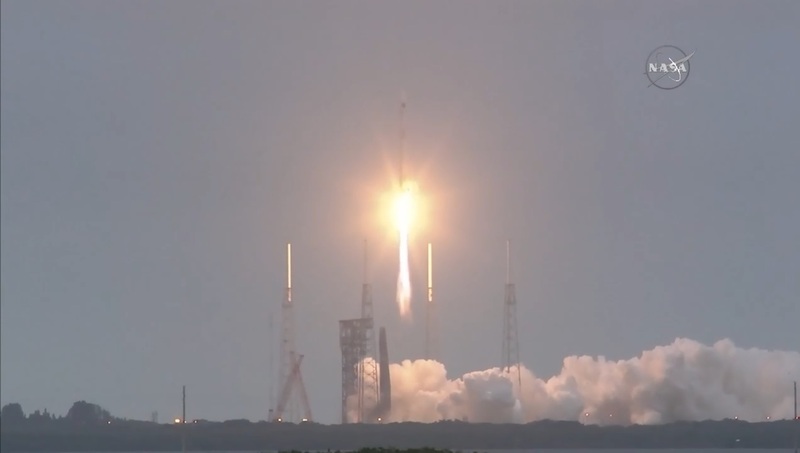 Departing the Space Coast, Atlas V ascended vertically for 18 seconds before pitching over and rolling onto its precisely calculated course, flying on a 44-degree launch azimuth to head to the north-east. Half a minute into the flight, the Propellant Utilization system started to actively modify the propellant mixture ratio delivered to the engine to ensure an optimized propellant consumption as RD-180 burned through 1,150kg of LOX and RP-1 each second of the flight. When the pitch program concluded, the Flight Control System was switched to the Zero-Angle of Attack mode, flying a pre-programmed attitude profile that was calculated based on upper level winds before liftoff. Atlas V pushed through Mach 1 at T+78 seconds and encountered Maximum Dynamic Pressure 12 seconds later with the RD-180 throttling back for a brief moment around MaxQ. First stage closed loop control was enabled after Atlas V had reached a pre-defined altitude and speed. In closed-loop control, the vehicle processes navigation data from the inertial measurement system to dynamically adjust the flight path to steer Atlas V towards its cutoff target. 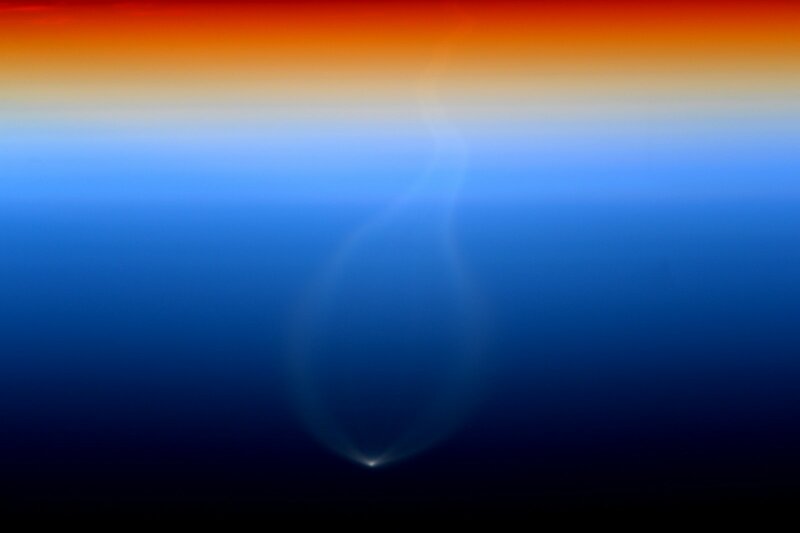 Heading through the rarefied upper atmosphere, thrust on the RD-180 engine increased to 422 metric-ton-force. Getting to the end of the first stage burn, Atlas V throttled back its RD-180 main engine to limit stress on the vehicle that only weighed a fraction of what it did at liftoff by that point. While the first stage was still burning, Centaur went through preparations for its first burn – firing a pyrotechnic valve to pressurize the Reaction Control System’s hydrazine tanks and completing a short in-flight chilldown of the RL-10C engine to set up for ignition. RD-180 went through a clean shutdown sequence at T+4 minutes and 15 seconds after finishing its job, burning through 284 metric tons of propellants. Six seconds after Booster Engine Cutoff, pyrotechnic devices were fired to severe the connection between the stages followed by the ignition of eight retrorockets to move the spent booster away from Centaur. Immediately after staging, Centaur purged its reaction control system with Nitrogen and the RL-10 engine pre-started on Liquid Oxygen. RL-10 ignition occurred ten seconds later and the engine reached its full thrust of 11,200 Kilogram-force to continue to push the stack into orbit. 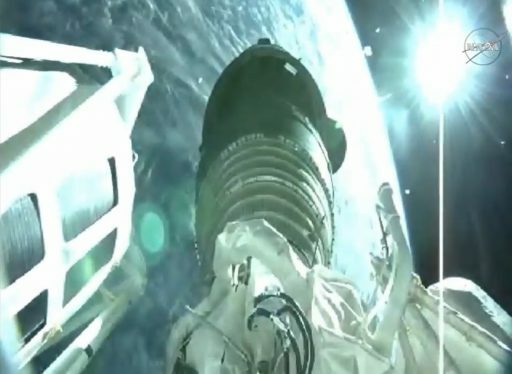 For the delivery of Cygnus, Atlas V only had to fire its Centaur upper stage once, burning for around 13 minutes and 45 seconds to give the 7,500-Kilogram spacecraft the necessary boost to reach orbit, also conducting a dogleg maneuver to drop the spacecraft off in the orbital plane of the Space Station. Separation of the extra-extended payload fairing that enshrouded the Cygnus spacecraft occurred just seconds into the Centaur burn. 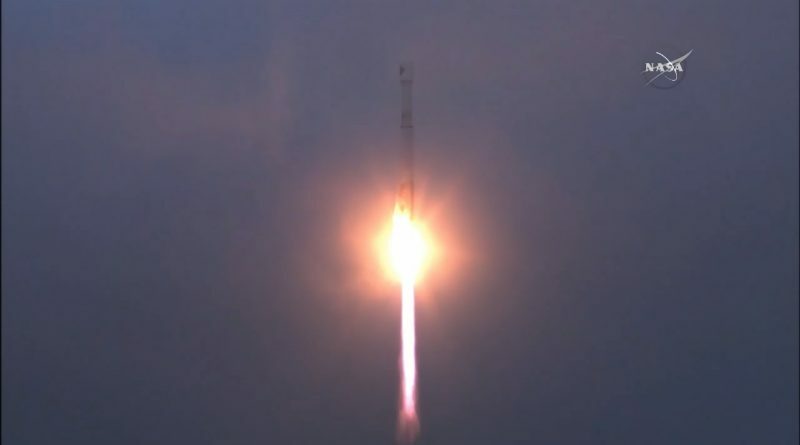 The OA-4 mission aimed for a circular insertion orbit of 230 Kilometers inclined 51.6 degrees and Centaur once again delivered a flawless performance. The onboard navigation system of Centaur showed the craft in an orbit of 228.9 by 230.0 Kilometers, inclined 51.64° at spacecraft separation. 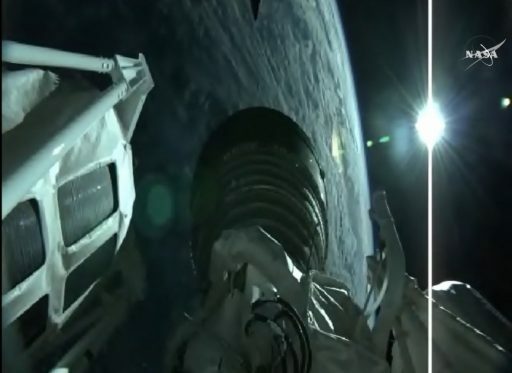 Shutdown on the upper stage was confirmed after passing T+18 minutes into the flight and Centaur conducted a re-orientation and stabilization maneuver to get into the proper attitude for the release of the Cygnus spacecraft. Cygnus was sent off on its journey 21 minutes after launch and successfully executed its initial steps in space, establishing a stable three axis orientation, and initiating communications with the ground. The deployment of the spacecraft’s new circular solar arrays was commanded one hour and one minute into the flight and its took the new UltraFlex arrays approximates 18 minutes to fully deploy. The Mission Control Team in Dulles, Virginia, confirmed that the spacecraft was power-positive, marking the successful conclusion of the launch sequence. Parting ways with Cygnus, the Centaur upper stage completed a Collision Avoidance Maneuver. Later, it will make a targeted deorbit burn to set up for a destructive re-entry over the Indian Ocean, south of Australia – away from any populated areas. For Cygnus, the climb up from its low insertion orbit towards the 400-Kilometer orbit of ISS begins in the overnight hours with its first Delta-V maneuver planned four hours after launch – a burn of close to 13 minutes to increase the vehicle’s velocity by 47 meters per second. Another large DV maneuver is expected in the morning (UTC) on Monday followed by a slight plane adjustment maneuver with a delta-v of 3 meters per second. A pair of optional orbit fine-tuning maneuvers is available on Monday. On Tuesday, Cygnus may perform another pair of DV burns to properly position itself for the initiation of the rendezvous in the early hours on Wednesday. Going through a methodical approach, Cygnus will close in on the Station from behind and below, performing a series of propulsive maneuvers to eventually reach a position directly below ISS from where it will ascend vertically to come to a halt at its capture point. Controlling the Station’s robotic arm, Kjell Lindgren and Scott Kelly will be ready for the robotic capture of the spacecraft expected at 11:10 UTC to mark the beginning of a stay of over one month to facilitate the transfer of 3,500kg of cargo. 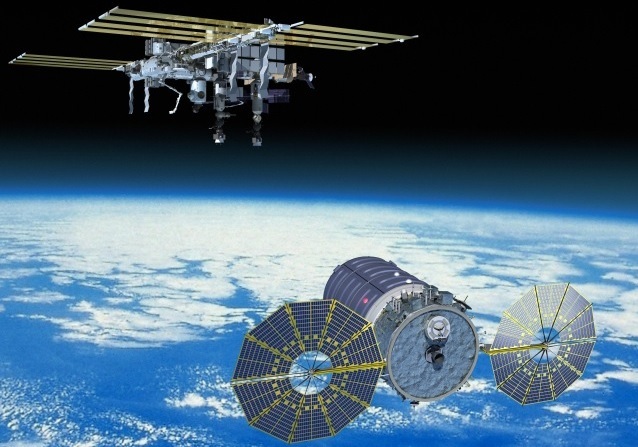 Cygnus will be the first commercial craft to be berthed to the Node 1 module of ISS. 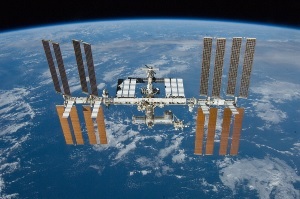 Copyright © 2019 ISS Expedition 45. All rights reserved.